Hedge funds are not perfect. They have their bad picks just like everyone else. Facebook, a stock hedge funds have loved, lost nearly 40% of its value at one point in 2018. Although hedge funds are not perfect, their consensus picks do deliver solid returns, however. Our data show the top 15 S&P 500 stocks among hedge funds at the end of December 2018 yielded an average return of 19.7% year-to-date, vs. a gain of 13.1% for the S&P 500 Index. Because hedge funds have a lot of resources and their consensus picks do well, we pay attention to what they think. 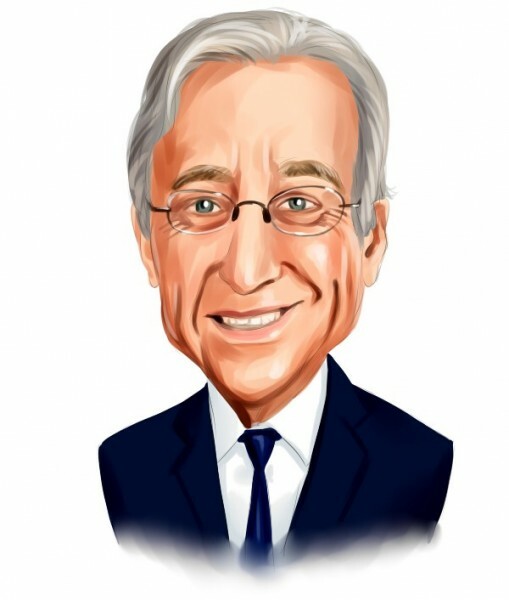 In this article, we analyze what the elite funds think of SYSCO Corporation (NYSE:SYY). SYSCO Corporation (NYSE:SYY) was in 34 hedge funds’ portfolios at the end of December. SYY has seen an increase in enthusiasm from smart money of late. 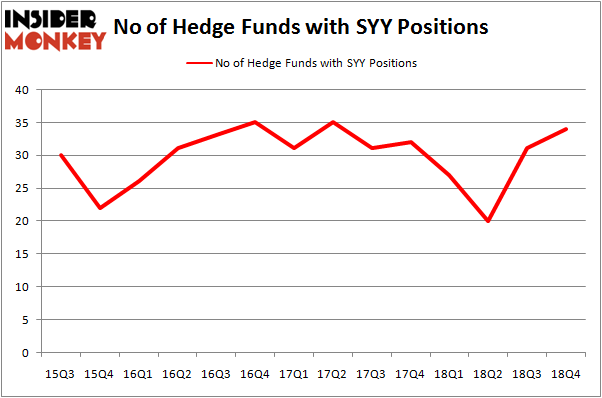 There were 31 hedge funds in our database with SYY holdings at the end of the previous quarter. Our calculations also showed that SYY isn’t among the 30 most popular stocks among hedge funds. Let’s take a look at the recent hedge fund action encompassing SYSCO Corporation (NYSE:SYY). How are hedge funds trading SYSCO Corporation (NYSE:SYY)? Heading into the first quarter of 2019, a total of 34 of the hedge funds tracked by Insider Monkey held long positions in this stock, a change of 10% from one quarter earlier. On the other hand, there were a total of 27 hedge funds with a bullish position in SYY a year ago. With hedge funds’ capital changing hands, there exists a few notable hedge fund managers who were adding to their stakes meaningfully (or already accumulated large positions). Among these funds, Trian Partners held the most valuable stake in SYSCO Corporation (NYSE:SYY), which was worth $1773.5 million at the end of the third quarter. On the second spot was Yacktman Asset Management which amassed $261.9 million worth of shares. Moreover, Renaissance Technologies, Two Sigma Advisors, and Millennium Management were also bullish on SYSCO Corporation (NYSE:SYY), allocating a large percentage of their portfolios to this stock. As industrywide interest jumped, key hedge funds have jumped into SYSCO Corporation (NYSE:SYY) headfirst. Hudson Bay Capital Management, managed by Sander Gerber, assembled the most outsized position in SYSCO Corporation (NYSE:SYY). Hudson Bay Capital Management had $7.5 million invested in the company at the end of the quarter. Benjamin A. Smith’s Laurion Capital Management also initiated a $4.7 million position during the quarter. The other funds with new positions in the stock are Matthew Tewksbury’s Stevens Capital Management, Ben Levine, Andrew Manuel and Stefan Renold’s LMR Partners, and Minhua Zhang’s Weld Capital Management. Let’s now take a look at hedge fund activity in other stocks similar to SYSCO Corporation (NYSE:SYY). These stocks are Nokia Corporation (NYSE:NOK), Barclays PLC (NYSE:BCS), Edwards Lifesciences Corporation (NYSE:EW), and ServiceNow Inc (NYSE:NOW). This group of stocks’ market values are similar to SYY’s market value. As you can see these stocks had an average of 30.25 hedge funds with bullish positions and the average amount invested in these stocks was $994 million. That figure was $2615 million in SYY’s case. ServiceNow Inc (NYSE:NOW) is the most popular stock in this table. On the other hand Barclays PLC (NYSE:BCS) is the least popular one with only 10 bullish hedge fund positions. SYSCO Corporation (NYSE:SYY) is not the most popular stock in this group but hedge fund interest is still above average. This is a slightly positive signal but we’d rather spend our time researching stocks that hedge funds are piling on. Our calculations showed that top 15 most popular stocks among hedge funds returned 19.7% through March 15th and outperformed the S&P 500 ETF (SPY) by 6.6 percentage points. Unfortunately SYY wasn’t in this group. Hedge funds that bet on SYY were disappointed as the stock returned 6.4% and underperformed the market. If you are interested in investing in large cap stocks, you should check out the top 15 hedge fund stocks as 13 of these outperformed the market. Is Illinois Tool Works Inc. (ITW) A Good Stock To Buy? Is Vertex Pharmaceuticals Incorporated (VRTX) A Good Stock To Buy? Were Hedge Funds Right About Getting Into Bank of Montreal (BMO)? Were Hedge Funds Right About Dumping FedEx Corporation (FDX)? Were Hedge Funds Right About Selling Northrop Grumman Corporation (NOC)? Were Hedge Funds Right About Ecolab Inc. (ECL)?